‘Airbnb host’ is the term used for someone who rent out either part or all of their home or other property via the Airbnb website. The people who stay in Airbnb rentals are known as guests. How Airbnb works for hosts is that you advertise either a room or your whole property, and guests then send you a reservation request. It’s up to you whether you accept any particular request, but you need to do so within 24 hours of it being sent. Being an Airbnb host is obviously a great way of bringing in some extra income. If you’re only renting out part of your home while you’re there, you may also meet some interesting people. People who live on their own may even feel safer with someone else in their home. You need to let your insurance provider know when you start hosting on Airbnb. Your premium may increase, so make sure that the extra income you’re getting more than compensates for this. Hosting on Airbnb does require extra laundry and cleaning, and it will also lead to greater wear and tear on your property. If you only let out your spare bedroom/s, it can be irritating having to share your kitchen (including the fridge) and bathroom with others, especially if you’re used to living on your own. Start by deciding what you want to offer. Do you want to let out your whole property, perhaps while you’re away on holiday yourself or if you’re working abroad? Or do you just want to let out your spare room at the same time as you’re at home. 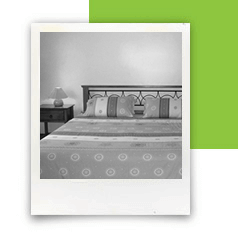 Take photos of the room or rooms you’re going to advertise. Remember to tidy up and dress each room first! Decide the prices and dates you are going to offer, and whether you want to provide breakfast. Think about whether you want to buy separate bed linen and towels for guests or just use your own. Although buying new is an up-front cost, a fresh look could help you to charge more. Write down house rules – it’s your home, so these are entirely up to you. In particular, make sure you cover checking and checkout times, smoking, pets, removing shoes indoors, areas that are out of bounds, and whether you’re happy for guests to bring back someone they’ve met to sleep in your let. If you rent your home, check with your landlord that they’re happy for you to host on Airbnb. Let your insurance provider know that you want to start hosting on Airbnb. If they don’t permit this, you can get a quote from us for buildings and contents insurance for Airbnb hosts which takes into account the additional risks arising from you running Airbnb from your home which are separate from those covered by the Airbnb Host Guarantee and Airbnb Host Protection Insurance. Register and list your property and get ready to accept your first guests! Once you’ve got ready to Airbnb your home with these tips, you can find a wealth of further advice on the Airbnb website on how to host Airbnb and how to get started with their service. There are two main aspects of safety that you should be aware of as an Airbnb host. First is your personal safety when you have guests staying in your home when you’re also there. Put bluntly, how can you minimise the likelihood that a guest will attack you physically in your home? Second, you want to be sure that property does not get damaged or stolen either by your guests or by others as a result of guests leaving doors open. Here are some tips which are designed to help mitigate both of these risks. First and foremost, remember that you don’t have to accept every guest who asks to book: if you feel uncomfortable about them, you can refuse the booking. Check potential guests’ profiles and reviews. Do they already have positive reviews? Do they fit with what you offer or does something feel ‘not quite right’? Be clear on booking what your house rules are, especially if you won’t be present when your guests are in your home. Have a lockable cupboard, safe or room where you can put your valuables when you’re out of the house. Consider installing smart locks so that you can be sure guests don’t have access once their stay has ended. Smart locks can also make your life easier by allowing you to let guests in at the start of their stay if you can’t be there. Keep all your communications with guests through Airbnb. The only exception to this is speaking to them on FaceTime or Skype before you confirm their booking so that you can see them and check they are who their profile says they are. The Airbnb Host Guarantee covers you for malicious damage and theft by your guests but it is not the same thing as home insurance. Airbnb Host Protection Insurance is a form of home insurance that complements your main policy by covering third-party claims of bodily injury or property damage directly related to Airbnb stays. Airbnb hosts automatically get both Host Guarantee and Host Protection Insurance with every booking.